If you have seen a drop in your Google rankings, it is vital for you to first establish whether your site has been hit by either the Panda or the Penguin algorithm. Penguin is the cause if you can see a search traffic drop on the 24th April 2012. The keywords that dominate your exact match anchor text are the ones usually hit the hardest by Penguin. The free back-link checking tool at www.majesticseo.com is the most convenient way to analyse your current keyword anchor text. All smokers are well aware of the risks that take with their health every time they light another cigarette.As a smoker you are more likely to die from cancer or a smoking related disease. There is an increasing movement making lots of noise, voicing their concerns over the potential dangers of e-cigarettes and vaporizers. 1840s: Swiss physicist Daniel Colladon (1802–1893) discovered he could shine light along a water pipe the basis of fibre optic. The water carried the light by internal reflection. 1870: An Irish physicist called John Tyndall (1820–1893) demonstrated internal reflection at London’s Royal Society. He shone light into a jug of water. When he poured some of the water out from the jug, the light curved round following the water’s path. This idea of “bending light” is exactly what happens in fibre optics. Although Colladon is the true grandfather of fibre-optics, Tyndall often earns the credit. 1930s: Heinrich Lamm and Walter Gerlach, two German students, tried to use light pipes to make a gastroscope—an instrument for looking inside someone’s stomach. Technologists and investors know about the rapid rise and subsequent slump in the fibre-optics installation industry during the past several years. Some have likened these changes to the swings in the semiconductor industry during the 1960’s. Although sales remain slow, it is clear that the industry will come back bigger than ever. The industry is expected to recover for the same reason that fibre optics became of interest initially—use of the Internet and the pressure for faster downloads and transfers continue to increase rapidly. Indeed, the demand for increased bandwidth in the next few years is expected to grow at an unprecedented rate. Single mode fibre is used for both interbuilding and intrabuilding backbone cable. At distances up to 3 km, single mode fiber will deliver data rates up to 10 Gbps with a bandwidth of 20Ghz. Its operating wavelengths are 1310 nm and 1550 nm. Single mode fibre’s primary uses are full motion video and any applications requiring extremely high bandwidth. As an intrabuilding backbone cable at distances of under 2 km, multimode fibre optic cable will deliver data rates up to 1 Gbps. Its operating wavelengths are 850 nm and 1300 nm. For distances of 100 m or less, the bandwidth is virtually unlimited. 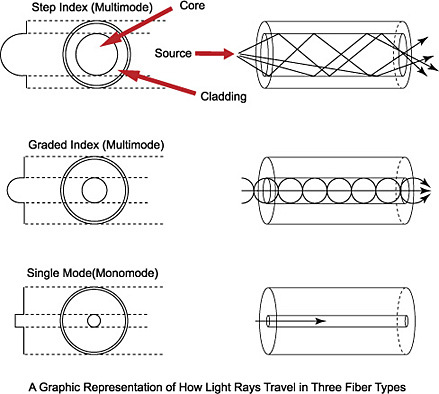 Multimode fibre is used for voice, data, security, and video systems. 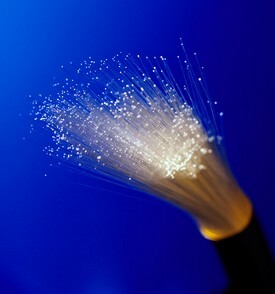 A fibre optic cable is made up of 100 or more incredibly thin strands of glass or plastic known as optical fibres. Each one is less than a tenth as thick as a human hair and can carry 10 million telephone calls. Fibre-optic cables carry information between two places using entirely optical (light-based) technology. Suppose you wanted to send information from your computer to a friend’s house down the street using fibre optics. You could hook your computer up to a laser, which would convert electrical information from the computer into a series of light pulses. Then you’d fire the laser down the fibre-optic cable. After travelling down the cable, the light beams would emerge at the other end. Your friend would need a photoelectric cell (light-detecting component) to turn the pulses of light back into electrical information his or her computer could understand. So the whole apparatus would be like a really neat, hi-tech version of the kind of telephone you can make out of two baked-bean cans and a length of string! The leading cause of fires in the kitchen is unattended cooking this could be a thing of the past by using kitchensafe.